"Due to the North Bay fires and poor air quality, the Contra Costa County's Department of Public Health has issued a cancellation of all outdoor activity this weekend. 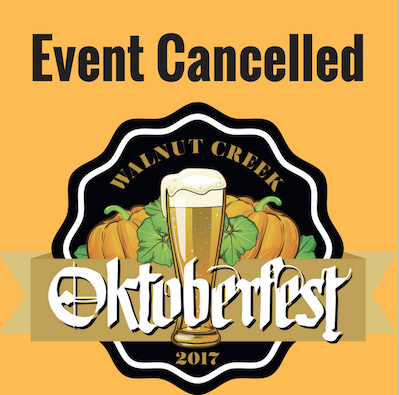 The Walnut Creek Chamber of Commerce and Visitors Bureau, Walnut Creek Downtown and Labadie Productions have therefore cancelled Oktoberfest scheduled for this Saturday, October 14, 2017. Our hearts go out to the victims of our neighbors who have suffered such loss and devastation."